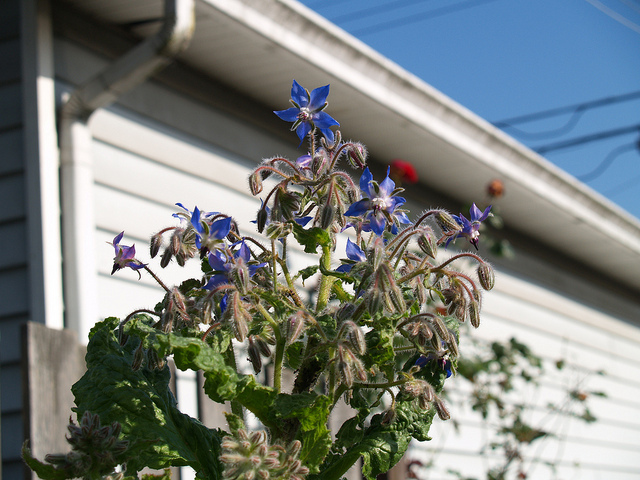 The borage isn't in the garden right now - this is just a reminder that sunnier days are on the horizon! Emailed local apiaries about the possibility of getting bees for 2011. Ordered my seed and mushroom plugs. Turned the worm compost to make sure everyone is still living, and added a liberal layer of leaf mulch to their habitat in order to continue staving off the cold. Pruned my neighbour’s quince tree while it’s in dormancy and can’t really be hurt too much – the branches were taking over our patio. Reviewed the garden while the foliage is most died back to plan building onto my garden’s bones as the weather allows. Started a new garden journal. Dead lemongrass is fragrant and good for teas and soups – I need to cut the patch back and bring it inside. My rosemary is flourishing right now. The kale is sweetened by the frost, even though it looks a mite sad at the moment. Unfortunately every other green was killed by the cold this year.